Make a deep cut just below the gills. Cut a slit several inches in length along the top (dorsal side) of the fish. As shown, make the same cut from the bottom side and lift up the meat. 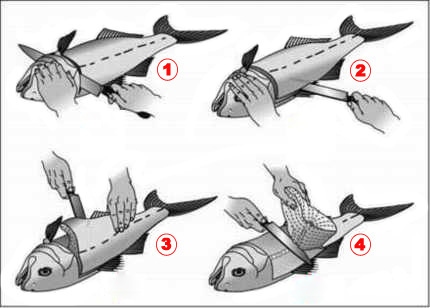 Finish cutting away the fillet by moving the knife towards the tail along the spine of the fish.